Full playable rules for six careers, nineteen specializations, and eight species, enabling flexible character recreation and development. Obligation rules to invest player characters in the story of Edge of Empire. Fantasy Flight have created a fantastic and innovative roleplaying system that embodies the flavour of the classic Star Wars setting. The book is of high quality and well written with a lot of information about the Star Wars Galaxy. The artwork is of very high quality and adds to the feel of the book. The default setting for the system is set between the Battle of Yarvin and the Battle of Hoth. The book is designed for players to play scoundrels, fringers and those who live a little beyond the law. 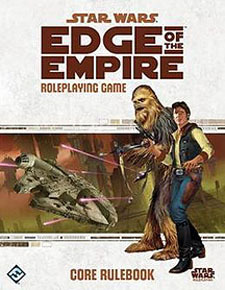 This is a great theme but is easly adjsutable for those who wish to play it differently There are eight species to choose from (Bothan, Droid, Gand, Human, Rodian, Trandoshan, Twi'lek & Wookiee) giving a good basis to choose from (the Droid is especially well done and very playable (a first for a Star Wars RPG)). The character has six character careers to choose from (The Bounty Hunter, The Colonist, The Explorer, The Hired Gun, The Smuggler & The Technician) each have a choice of specialty which helps to customise the character (and specialites from other careers can be purchases with experiance points (even during character creation) allowing players to make interesting and diverse charactes. There is also a specialty for a Force Sensitive Exile which allows those who want to bring force users in to the game with out them being game breaking (but still very playable). The system uses dice pools to determine success. It does this with specialised dice (but standard dice can be used just as effectivly). (with the player forming a pool of ability (green d8) and proficiency (yellow d12) dice based on their abilitity scores and skill level and dice assigned by the GM difficulty dice (purple d8) and challenge dice (red d12), also the pool can be modified (due to enviromental factors (like poor visibility) with boost dice (blue d6) and setback dice (black d6). The dice results make for and innovative system where a character can fail but still gain some advantage from the situation. This really adds an interesting dynamic that enhances the storytelling side of the adventure. All in all I highly recommend this as a roleplaying system for new and experience GM and players alike.